I flew into Seattle on a Thursday evening flight. As an aside, that's the only way I'm ever flying to Seattle again...you don't lose the day and when you arrive everyone wants to go to bed - not just you! *LOL* I flew in early because Gaylen promised to show me ALL of the fabric stores in Seattle (besides Joann's) on Friday. So we spent all of Friday trooping through fabric stores ~ in the sunshine and the rain. Oh and be forewarned this is a picture heavy post! The tour started with the Hancock's in Kirkland. This was my request. I'd had such an amazing experience with Hancock's in Houston, I mistakenly thought that all Hancock's were that wonderful. Nope not wonderful and I'm not sure if it's the store or Hancock's financial situation. Whatever, we looked for some patterns, looked at some of the fabric sale tables and bounced. However, since I really want some bias binding in blue and yellow gingham, I did get a yard of each to make some. I also bought a yard of ribbed knit. Next on the tour was Pacific Fabrics Sodo. It's a warehouse with an entire floor of fabric, notions, and yarn. It has an interesting selection of fabrics - some on bolts and some on tables. A full and extensive selection of notions, books (both sewing and knitting/crocheting), indie and Big 4 patterns. I bought some cotton knits here because they had some basics (white & gray) and they were running a 20% off sale. Although, it was fully stocked, it was just an okay experience for me. We headed to downtown Seattle for the next stop on the tour - Dry Goods Design. This store has a large area for teaching right in the front of the store. You can clearly see the Bernina machines and the cutting tables, so they practically invite you to come in and ask about sewing classes. I thought of this store as a sewing boutique because it had a little bit of everything and no depth in any product. Yes you could find thread there but not the selection of say a Joanns/Hancocks or even Pacific Fabrics. Yes, they had a great sewing phone cover but do you go to the fabric store to purchase one of those? I named it a sewing boutique because I really hope the sewing classes are paying the rent because they use valuable real estate that could be used for more of everything. And if the classes are that important than I appreciate the service this store does to encouraging others to sew. We stopped for lunch at Collins Pub - down the street from the sewing boutique and I can highly recommend them. The burgers were awesome, the service good and the atmosphere cool. I liked the atmosphere here. You could tell the owner of the store cared about sewing and making sure sewists had the opportunity to go to the local fabric store...and while I didn't buy anything here...I could see myself doing so. Gaylen checking out a piece of fabric - great buttons in the back right? I walked through the door and felt like I was home. This is what fabric stores were when I was growing up, when I became a mother and into my 40s this is the type of fabric store I always felt comfortable in. This was Jeannie who reads both my and Gaylen's blog! Gaylen saved the best for last! This is a small store slightly larger than the sewing cave but the fabric is artfully displayed and there is a depth to the collection. I have very few pictures of the store because I bought fabric here. But I loved this shop! The fabric is well displayed and the collection well curated. There is more fabric than notions or patterns but there was a display of indie patterns (Cashmerette, Grainline Studio, Named, etc.) A small display of notions, in case you need something to finish a garment and a great section of clearance fabrics. This is a rayon panel print knit! If I lived in Seattle honestly this would be my spot. I would shop here and at Nancy's since they both carry different types of fabric but both appealed to me. Seattle is not a fabric desert - there are options - I'm sure a lot more options than for some other sewists. I don't think it's fair to compare the NYC Garment District to the Seattle Fabric Stores honestly I could sew happily here. I'd need a car (LOL!) but I could sew many beautiful garments from the resources in Seattle! So when I stop petting my fabric (it arrived today from the West Coast - thanks Gaylen!) I will write up my Sewing Expo experience. A newsbreak - I bought A LOT of fabric! You missed Tina's Fabrics in Madison Park but otherwise you hit them all. Brava. I missed you at sew expo, maybe next year. Happy sewing. Thanks for letting me know - next time! Lovely post, I feel like I just came home from a vacation of fabric shopping with my girlfriends! Beautifully told! Next trip--allow time for Portland. Rose City Textiles plus Fabric Depot plus lots more. Claire - I google mapped it and it's 3 hours from Seattle. I have always wanted to shop the Portland fabric stores so it will be something to think about! Great to see you at Expo! I agree with your assessments. 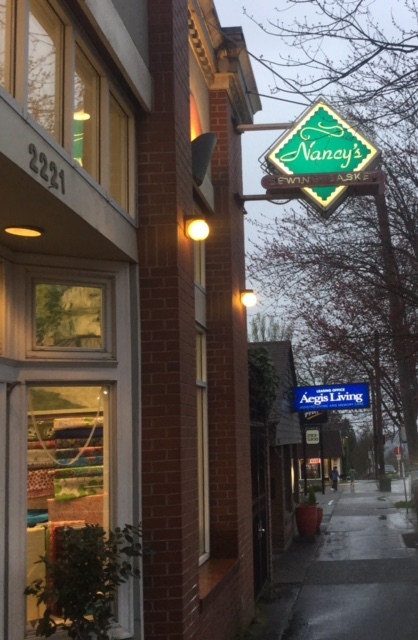 When I lived on Mercer Island I went over to Queen Anne hill to shop at Nancy's quite often. It would be very sad to lose this treasure of a store. Susan - it was so great to spend time with you at Expo also! Thank you for a lovely post and reviews. You were busy that day! And lucky you to have a friend who knew the territory. Terri - Gaylen was the best! We did spend all day because she let me sleep late and we stayed at each place as long as I wanted which was really generous of her. I live in Seattle, and I forget Tina's all the time. Nothing personal, I'm just never over there when she’s open. We are still on an upswing for fabric stores here: at this point, we do seem to have one small fabric store in almost (sorry Columbia City) every major neighborhood. So if I'm running an errand in West Seattle, I can go to West Seattle Fabric Company. One new thing we do have is My Fabric Stash, a fabric stash consignment store. It started in one of the community centers twice a year, and now: Attention cruise ship tourists: they are a shop in the Pike Place Market! EZ to find! It’s a great idea that needs to expand to other cities. SJ - My Fabric Stash sounds amazing! I would definitely have some contributions for it if I lived in Seattle. I was impressed by the amount of fabric stores you did have - there is good fabric shopping there! I LOVE District also! Ashley is the nicest and the fabric there is beautiful as is the space! I love going and just seeing what is in store. 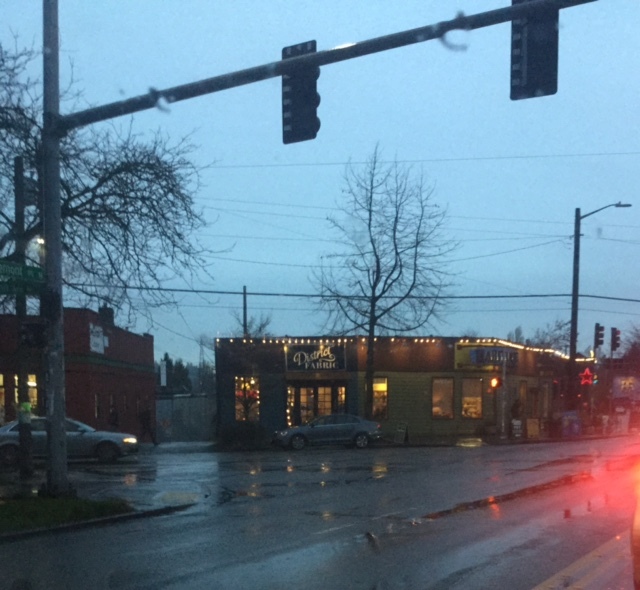 Next time you visit, you should make a trip down to Portland - there are several more shops out there and really wonderful food! mingming - District was awesome! Seriously if I hadn't been going to Expo the next day I would have bought more. That store is a treasure! This post is so great. I live in Seattle and I didn't know about Tina's or Stitches. And I didn't realize the Pacific Fabrics in SODO was so different from the others. I go to the one in Northgate and Bellevue all the time. I guess I need to head down there. I hang out in Fremont quite often, but usually in the evenings and District Fabrics is always closed when I wander by and peep in the window. I need to make a point of going when they are open! I haven't been to Nancy's in a while, but maybe I'll go this weekend. I wonder if she's considered selling the business. I've been thinking that my dream job would be to own and operate a fabric store and my husband and I were seriously talking about it as a 5 year plan, but that was before I started my current job that I am really starting to love. Another place for some good finds is the sewing section of Seattle Re-Creative on Greenwood, near 85th. Because they are donation based, there are always interesting items in there. I like it for finding fun trims and packaged bias tape/hem binding, but I have found some nice fabrics there as well. MizzSmartyPants - next time I will have to see Pacific in Northgate and Bellevue since last year I bought several pieces from them at Expo and liked their selection. Glad to have introduced you to some new spots - hope you enjoy exploring them! I live in Portland so I travel to Seattle frequently. Some how, I missed 'District'. It looks great. Thanks for the tip! 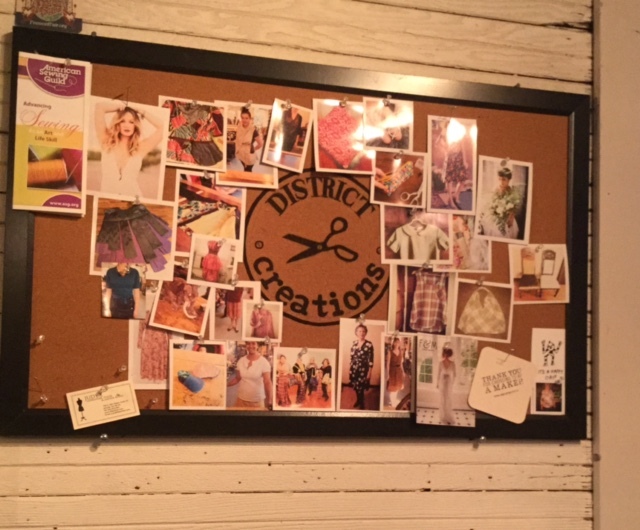 ellegeemakes - you have to go to District! Nancy's owner is quite elderly, but the business was started for the daughter (Nancy herself) and will continue to be run by her. I doubt they're going anywhere. That's good to hear! Cause I think Nancy's is a fabric treasure and wish I could shop there often. What a nice experience you had with fabric shopping with Gaylen! Lovely fabrics and look forward to your post about the Expo! I'm so glad you made it to District Fabric and Nancy's Sewing Basket. I was a little worried when I started reading your post in the first couple of stores you visited! There used to be a Hancock fabrics in Lynnwood, just a little north of Seattle, which was actually a very nice store. You are right, Hancook's Kirkland store is a disappointment. Next time you visit Seattle, try Pacific fabrics in Northgate which is actually a decent store. Anyway, I'm glad you had some fabric shopping fun in Seattle. Looks like great time in cute shops and lovely fabrics. Thanks Sheila! I did have a wonderful time. It looks like there's a lot of fabric shopping in Seattle! I look forward to visiting Nancy's someday. I follow their blog and their store looks so wonderful! That first reversible panel print is gorgeous! Wow. You made some stunning purchases. I'm glad we all got to visit, especially knowing you may not come back next year.